'Left Behind DVD' is the apocalypse based action movie based on the bestselling end-times novel series by by Jerry B Jenkins; Tim LaHaye. The Left Behind DVD features Hollywood star Nicolas Cage and brings to life in modern times the ancient biblical prophecy of The Book of Revelation. The Steele family find themselves caught up in the cataclysmic end-of-time events. Airline pilot, Ray Steele, played by Nicolas Cage, struggles to control his plane as passengers disappear in what is later proved to be The Rapture - which has also taken away key air traffic control staff. On the ground, Ray's daughter Chloe Steele (acted by Cassi Thomson) searches for her young brother and mother. Both have disappeared as the Biblical event unfolds. Forcing herself through the chaos, Chloe must come to terms with a world filled with terror and despair. Running out of fuel and with his aircraft failing, the world below is plunged into apocalyptic panic. Ray must guide the plane with the help of GWN reporter, Cameron "Buck" Williams (played by Chad Michael Murray) who takes over the role of co-pilot in the face of the crisis. Buck and Ray struggle to control the plane at 30,000 feet and try to understand the most incomprehensible events in the history of mankind happening right now. In the blink of an eye, the biblical Rapture has struck the world. Millions of people have disappeared without a trace. All that remains are their clothes and belongings. Terror and chaos spread around the world. The vanishings cause unmanned vehicles to crash and burn. Planes fall from the sky. Emergency forces everywhere are devastated. Gridlock, riots and looting overrun the cities. There is no one to help or provide answers. In a moment, the entire planet is plunged into darkness. 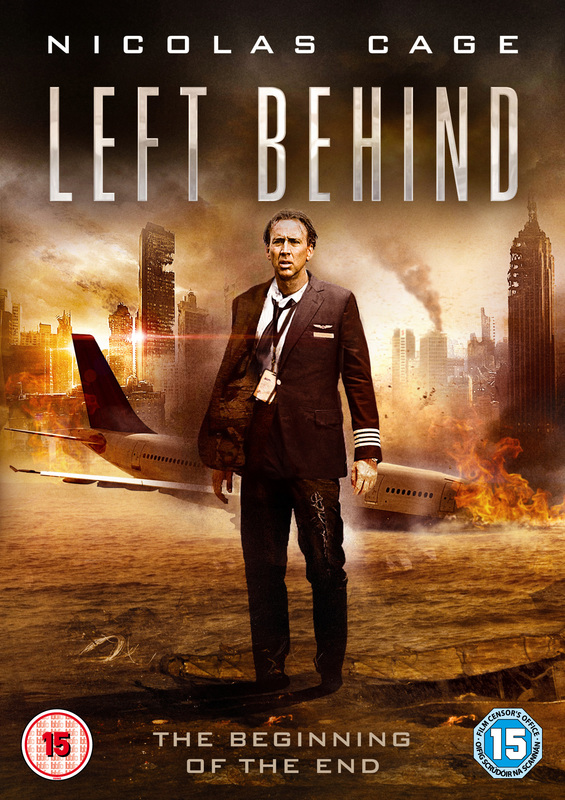 'Left Behind' (2014) has earned five Doves from The Dove Foundation, our best rating. It is entertaining, suspenseful, and will motivate viewers to examine their own lives. 'Left Behind' is an apocalyptic Action-Thriller movie starring Nicolas Cage based on the New York Times bestselling novel that brings biblical prophecy to life in modern times. The Steele family is caught on the razor's edge of that darkness. RAY STEELE (Nicolas Cage), an airline pilot, struggles to calm, and ultimately to save the lives of the passengers that remain on his flight, as the world below loses its ability to help his plane, and any other to safety. Running out of fuel, his equipment failing, his crew escalating into panic, Ray must guide the plane with the help of GWN reporter, CAMERON "BUCK" WILLIAMS (Chad Michael Murray) who takes over the role of co-pilot in the face of the crisis. For Buck Williams, being trapped at 30,000 feet with a plane full of terrified passengers means a struggle to understand the incomprehensible. On the ground, Ray's daughter CHLOE STEELE (Cassi Thomson) struggles to find her young brother and mother, both of whom may have disappeared in the Biblical event. Forcing herself through the chaos, Chloe must navigate a world filled with terror and despair. Left Behind DVD was published by CBS Distribution in January 2015 and is our 13445th best seller. The ISBN for Left Behind DVD is 5037899056578. Left behind? Sorry, no time! 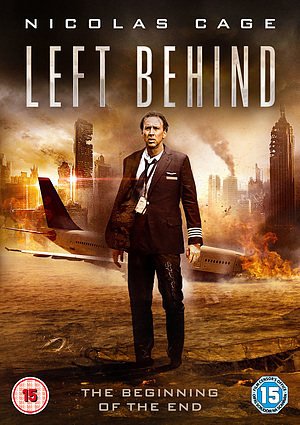 We have just watched "left behind" blatently and unashamedly Christian; it was BRILLIANT!!! Nicholas Cage excelled himself, his daughter must have lost two stone with all her running around; it was exhillerating and thought provoking; a must see for all practising Christians. We are now awaiting the next film; the tribulation or post tribulation appocolipse. Excellent film: challenging to all viewers. I'm glad I ignored reviews of this DVD in other media outlets (they don't like the Message, so they shoot the messenger)--- this film is an uncompromising challenge to complacency. It further provided me with an added motivation to prayer & personal Christian witness: not panic-stricken (Jesus was never in a panic), but urgent. Parents we know who are not yet Christians, with a 15 month old daughter: currently, she will go & they will not. A married couple where the wife is a Christian & the husband is not yet a Christian: presently, she will go & he will not. There is also some good attention to detail: the Fish sign hanging from the rear view mirror in a now unoccupied car. The Bible verse at the end of the film: Mark 13:32 inspires us to remain Biblically vigilant. I dare you to buy it! As an action film, fine. As a supposed Christian film, dire! I watched this with a non Christian friend who commented if he didn't know it was meant to be a 'religious' film, he'd have just thoughtit was an action film on how to land a plane. The acting etc is good, but this is a very, very Hollywood lite version of the original. If, like me, you wanted the original, you can get the triple box set here-seriously, avoid! If you study your Bible carefully you will find that the ones that are 'taken' are not the saved but the lost. The 'Rapture' is based on a fundamental misreading of the scriptures I believe. Nothing unusual here for a Christian Film, I actually felt sorry for Nicholas Cage who must be struggling for work to have taken this job. One of the worst made films of all time. School buses going over bridges hours after people disappear. Please do not encourage these film makers any more and do not buy this movie, you will be able to get it for aout 10pence at a local charity or Christian second hand stall shortly. The film was very good but it would have been more better if the trailer which showed the bright lights in the sky as the Christians were raptured was shown in the film to make viewers think more carefully. Got a question? No problem! Just click here to ask us about Left Behind DVD. Don't see a reg. marked in description so wondered if UK. compatable. A veteran airline pilot struggling with the pressure of his troubled marriage and strained relationship with his headstrong daughter Chloe, Ray Steele is responsible for the passengers that remain on his flight after the Rapture. In a world in crisis, with all public and private transportation services in chaos, Steele's jumbo jet is running out of fuel and all of the lives in his care are running out of time. An international correspondent for Global Weekly News (GWN), Cameron "Buck" Williams is returning from the miraculous events of the "Russian Pearl Harbor" in Israel. After the Rapture, Buck remains on the flight piloted by Rayford Steele. Working with Rayford, Buck seeks answers and a way to save himself and the lives of the others on board the fateful flight to New York City.